In recent years, post-rock has become the urban sprawl of independent music. Invasive, bloated, and undeniably comfortable, it has steadily, albeit consciously, delineated from its richer, more substantive origins to assume the role of pleasant background music, antiseptically reliable but hopelessly predictable. Tortoise’s feral meanderings and Mogwai’s bulky, aggressive overtones have been replaced by Explosions in the Sky’s brand of sanitized consonance and Mono’s overly dramatic pensiveness. It’s not that the offerings of Explosions in the Sky or Mono (or the busload of other contemporaries that base their musical existence on the twelve minute, crescendo-climax-outro formula) aren’t aesthetically appealing. Rather, it just seems as if the genre has lost its creative compass, settling for pedestrian acquiescence in lieu of any sort tangible imaginative progression. Do Make Say Think’s fifth and latest full length, You, You’re a History in Rust, however, proves that all is not lost in the post-rock world. Certainly, upon first glance, the most remarkable aspect of the album is its application of vocals to several different tracks and its deeply texturized, pine and earth feel. Described by the band as “like moths drawn to a flame, instruments trace erratic circles around a flickering, elusive centre,” You, You’re a History in Rust is a continuation of Do Make Say Think’s non-studious and oft-pragmatic legacy. Like its predecessors, &Yet &Yet and Winter Hymn Country Hymn Secret Hymn, You, You’re a History in Rust is a rational, cognitive evolution forward – the sort of artistic adeptness that is both wonderfully imaginative and eerily absent from other contemporary post-rock outfits. Like all Do Make Say Think albums, individual songs are mere components within the greater architecture of the overall album. That is, the album is a collective patchwork of compromise, carefully, albeit dynamically, constructed to be appreciated as a singularly cohesive product. For example, the opening track, “Bound to Be that Way”, is meticulously and beautifully mired in ethereal irresolution: breathy percussion cautiously surrenders to an almost indifferent conglomerate of keys, coniferous guitar notes, and veiled wood instrumentation. The song serves as an introduction to You, You’re a History in Rust, a basal prelude to the organic theme of the album as a whole. Widely commented upon by both band and critics is Do Make Say Think’s long-standing insistence upon recording in rural settings, relying upon the pastoral surroundings of sky, land, and water to serve as an operational catalyst. 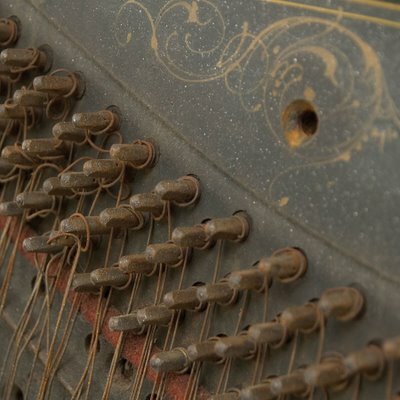 As such, there’s a certain disconnect between the music and human society, forcing the listener to patiently let the music unfurl itself. Such attitude is readily apparent on the album’s second track, “A With Living.” Cinematic in scope, “A With Living,” comes off like a slow-burning tragedy, sleepily developing before cautiously retreating. If there is, however, to be an identifiable problem with You, You’re a History in Rust, it is that the album, at times, expects too much out of the listener. Chasmal gaps and open plains of nothingness dance in and out of the album. As an example, take the album’s fifth track, “History of Glory:” For large portions of the song, it’s uneventful and arid, building into an uncomfortably dreamlike crescendo only to fall into a cavernously pointless mixture of sound and melody. Certainly, the track meshes with the thematic overtones of the album, but at what cost? As such, Do Make Say Think’s puritanical approach to collective continuity is counterproductive because the listener simply loses patience a skips to the next track. While the album does feature its share of muted sensibilities and fruitless tangents, it would be nothing short of a calamity to label this effort as anything but extraordinary. You, You’re a History in Rust, in a cumulative sense, is an acutely cultivated yet complex entanglement of keenly written songs ripe with natural beauty. It’s an epiphany of sorts, a sort of nouvelle vague that decries musical complacency. In short, You, You’re a History in Rust is a state of mind as much as it as record. And hopefully, it’s a mindset that will catch on with at least some of the post-rock outfits that dot the musical landscape. But even if it doesn’t have the influential impact that it should, Rust is still one hell of a record and, in hindsight, one of 2007’s best. The backbone is electronic but the soul is very clearly something else. With their trademark “thick like a Stalin (!!! )” brand of post-rock inspired doom, the Russian Circles are back. As a teaser to their upcoming album, Station (05/06/08 on Suicide Squeeze Records), they’ve posted a new track, Harper Lewis, here.